If the bailout money is mainly to rescue Laiki bank (which it is), what happens if, instead of accepting any of the recent proposals, Cyprus decides to let Laiki go bankrupt instead? Can it stay in the Euro? I am not going to discuss if this politically feasible. And for the moment, let’s even ignore if this is politically desirable (it is not, but we’ll have more to say about that later). But purely financially, it is not only feasible, it’s far cheaper than anything that’s on the table! And no law or promise needs to be broken. we are assuming not only Laiki goes bust (we don’t have deposit data on Laiki separately), but instead that all deposits in Cyprus are equally affected (as if all banks had to default). And lastly, we are assuming that the 2.7bn damage to bondholders is all damage to government backed entities like pension funds, so we add the full 2.7bn back to the total bail-out cost. Just to be sure: each of the assumptions by itself would be a gross overstatement of the problem. So the resulting number will also be a very gross overstatement of the cost. The calculation then is as follows: Unsecured bond holders lose everything, which is EUR 2.7bn, leaving EUR 14.3bn to be lost by depositors. Hey, they accepted the credit risk (minus the first 100,000, which are government guaranteed), and got a very high interest rate in return (about 4% higher than on a deposit in a German bank). Then we also have the data from the ECB and Barclays above. Then how much money is Cyprus short? It’s obviously less than 17bn, but how much? Well, take out 15.3bn of the 68.4bn in total deposits, you get that at most, every deposit holder would loose 22.3% of their deposit in case of default of Laiki Bank. The government would then step in with the deposit guarantee, at a full 22.3% cover for all deposits below 100,000 (that’s EUR 7bn for these guys), plus the full 22.3% of the first 100,000 for all other depositors, so we need to estimate the number of deposits above EUR 100,000. I think it is reasonable to assume that the median (not average) deposit of those that are between 100k and 500k is about 200k (to be conservative, we have to err on the side of a smaller guess than a larger), so there should be about 41,000 of those. And if the median size of those over 500k is, say 800k (again, to have a “safe” guess, we need to guess low), there are about 36,000 of those. 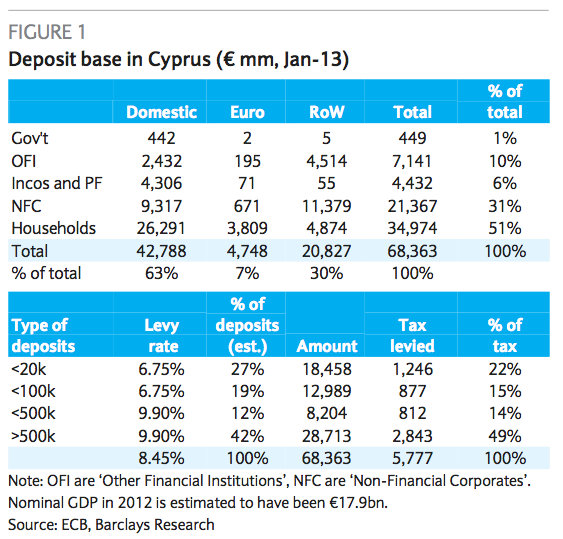 So Cyprus pays another EUR 22,300 to each of the 77,000 large depositors, which is EUR 1.7bn. So in my, already massively conservative, calculation, honoring the deposit guarantee in full will cost Cyprus EUR 8.7bn, far, far less than the EUR 17bn it needs to keep Laiki alive. We can be super-conservative, and assume that a large part of the 2.7bn of the unsecured bank debt is held by pension funds that the government ends up having to bail out sooner or later anyway. Even then, the total damage to Cyprus is “only” EUR 11.4bn. The haircut is already in the ball-park of what’s being discussed. (Probably by far) less than 22.3%, and even that is only on the part that exceeds the first EUR 100,000. So please, please tell me: Surely it can’t be as easy as that? Where am I wrong? Is the political cost of bank failure really so unthinkable? The point is not to advocate letting Laiki go. Because of the interconnectedness of banks through inter-bank lending, this can have consequences that I am not in a position to analyse, as the data on inter-bank lending is not public. Laiki’s bankruptcy should be avoided, and I am confident it will be. No, the conclusion here is of a different kind: Since a bank bust is cheaper than a country default and Euro exit, Cyprus knows that the current stalemate can never lead to a bankruptcy of Cyprus, but only to a bankruptcy of Laiki (and maybe other banks). Why? Because the decision to let these banks go is up to Cyprus! It is the EU that must avoid this outcome at all costs, since it would ruin the credibility of all the talk about a banking union. Many commentators in the last days wrote that, with the proposal of of last weekend, the EU has made a laughing stock (or worse) of its avowed commitment to a banking union and demonstrated that there is no Intra-EU solidarity when it comes to saving the banks. This calculation shows a very simple truth: That the exact opposite is the case. While Europe has us all believe that this is about a potential bankruptcy of Cyprus, Cyprus knows this not to be true. The sovereign default will not happen (at least in the short run) because Cyprus has the option to withdraw its support of Laiki at any time. Since a bank bust remains an intra-cypriot decision to make, it is not only self-evidently possible, but always, always preferable to a sovereign default. To fully appreciate what position the Cypriot politicians are in, we have to remind ourselves also of the fact that the Cypriot banks’ solvency problem stems in a very large part from a contribution to the Greek, “voluntary” debt restructuring which hit the Cypriot banks disproportionally. Cyprus is being treated like an errand child for having been recruited into an act of solidarity that hit Cyprus very much harder (on a per-GDP and per-capita basis) than any other European country. We will have to be honest with ourselves and Cyprus, if we want their politicians to be constructive, and recognize that they have already paid a disproportional share to save the Euro, when Greece was “saved”. The EU may still have the longer straw in this stalemate, but not quite as long as it seems at first.